Tetherball (also known as swingball) is a game for two opposing players. The equipment consists of a 10 ft (3 m), stationary metal pole, from which is hung a ball from a rope, or tether. Now, I’m no tetherball champ by any stretch of the imagination. But when I was a kid each summer I could barely wait to go to our family reunions at White Oak Park. My siblings and I knew that when we arrived there would be huge amounts of food, burlap sack races, egg tosses, water balloon fights, treasure hunts, and a killer playground that had a tetherball court! We raced with all of our hearts, played hard in the blazing sun, ate way more than we should’ve, and battled on the tetherball court until we were ready to drop from exhaustion. I want to stay connected to God like a tetherball is connected to its poll. Don’t you? Whether the ball is moving or still it is connected to the poll; securely tethered by a rope. Whether you and I are moving or still we can be connected to God, securely tethered by grace and strengthened in prayer. The 18th chapter of Luke begins with Jesus telling his disciples a parable about a persistent widow. He told them this story to encourage them to pray continually and to not give up. (Luke 18:1) The widow, Jesus told them, wanted justice so she went to the judge and asked for favor against her adversary. The judge didn’t care much about God or justice so he brushed her off and sent her away. But she kept going back and asking for justice, so finally the judge gave in because he didn’t want her to bother him anymore. Jesus encouraged his disciples to be persistent in prayer. The word tether actually means “to tie something with a rope or chain in order to restrict its movement.” I like the idea of having my life ‘restricted’ to the will of God … to be bound by His Spirit through prayer. There’s no greater freedom. No greater power. When we trust in Jesus, we are bound securely by His faithfulness. God is faithfully listens to and answers the prayers of His children. Do you believe this? Even in times when you and I don’t feel like He’s listening or answering, the Bible assures us that God hears our prayers and responds to each one. And He will complete the good work that He’s begun in your life as you seek Him in prayer and tether your heart to His will. Dear Lord, Please forgive me for all of the times when I have chosen to disconnect. I want to be tethered to Your heart, Lord. I need to be. Help me to set aside my own will and trust in Your plan for my life. Take a personal inventory. What area in your life are you struggling to connect with God on? Have you stopped talking with Him about it? Spend time in prayer. Ask God to bind your heart with His regarding the details. 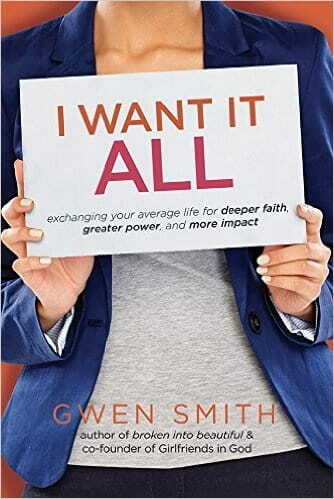 Ready to rekindle your faith today?Gwen Smith’s new book, I Want It ALL, gives you practical help to connect your struggles to the solutions of God found in His Word. Order yours today from Amazon, Barnes & Noble, ChristianBook.com or your favorite retailer.